1. Preheat the oven to 180°C, gas mark 4 and grease 4 x 11cm diameter and 4cm deep tartlet tins with butter. 1 tbsp of cold water and pulse until the dough just starts to come together. You might need to add a bit more water if it looks too dry. 3. Tip the dough out on to the work surface and lightly knead until the pastry is smooth and just uniform. Chill in the fridge for at least 30 minutes before rolling out. 4. While the pastry is chilling, chop the rhubarb into small pieces and place into a saucepan with the sugar, honey, lemon juice and vanilla bean paste. Simmer over a medium heat for 20-30 minutes until it is thick and jam-like. Remove the compote from the heat and leave to cool. a further 10 minutes until the pastry cases are a light golden brown. Set to one side to cool and lower the oven to 140°C, gas mark 3. 6. For the custard, whisk the egg yolks and sugar together until pale and well combined. Place the cream and milk into a saucepan and add the vanilla. Heat over a medium heat until almost boiling, and then pour the hot mixture into the eggs in a steady stream, whisking all the time or the eggs will curdle. 7. 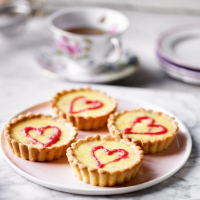 Spread a thin layer of the compote into the bottom of each tart case, and transfer the remainder into a piping bag. Bring the tarts as close to the oven as possible, then carefully fill with the egg custard. Bake for 25-30 minutes, or until the custard is set but slightly wobbles in the middle. After 15 minutes baking, open the oven and carefully pull out the tarts. They should be set enough so you can pipe a heart on to the top of each. Return the tarts to the oven for the last 15 minutes’ baking time. 8. Once set, take them out of the oven, leave to cool completely, then remove from the tins and serve.